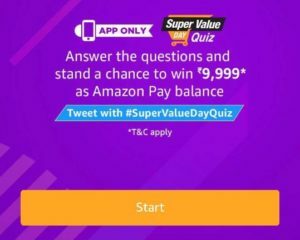 We Are Already Regularly Posting The All Amazon Quiz Time Quiz answers & All Amazon App Treasure Hunt items, Before Few Days We Have Posted The Amazon App Quiz , Now Here is Exclusive Chance To Win Rs.9.,999 From Amazon. 3. During Super Value Day, Mr K purchased groceries worth Rs 1500, what is the maximum cashback he can avail? 1. This Contest will commence on 1st June from 12:00:01 a.m. (IST) to 11:59:59 p.m. (IST) (Contest Period). 5. The draw of lots will be carried out during the Contest Period for the questions and a total of 20 participants will be selected as winners by a random draw of lots. A total of 20 participants will be selected as winners of the Contest. 6. The declared winner(s) will be eligible to win Rs. 9,999 (hereinafter referred to as “Prize(s)”), which will reflect in the winner’s Amazon.in account as Amazon Pay Balance.